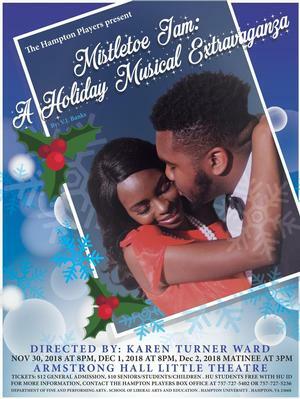 HAMPTON, Va. (November 14, 2018) – The Hampton Players & Company present “Mistletoe Jam: A Holiday Musical Extravaganza” in the Little Theatre of Armstrong Hall on the campus of Hampton University on Friday, November 30, Saturday, December 1, 2018, at 8:00 p.m., with a Sunday matinee on December 2, 2018 at 3:00 p.m.
Come join the Hampton Players and Company as they celebrate the most wonderful time of the year with their production of, “Mistletoe Jam.” This musical extravaganza infuses the soulful and familial sounds of the holiday season with dance, comedy and theatre. The story follows Regina Chestnut, a Scrooge of epic proportions, as she is taken on a musical journey through her past, present, and future to rediscover her love and the true meaning of the holiday season. “Mistletoe Jam” reimagines Charles Dickens’ “A Christmas Carol,”with classic and contemporary hits we know and love. Relive holiday seasons past with a medley of R&B and gospel holiday standards such as, “Baby It’s Cold Outside,” “I Saw Mommy Kissing Santa Claus,” “O Come All Ye Faithful,” “This Christmas,” “All I Want For Christmas,” “Silent Night,” and many more. Bring your family and friends out for a night full of good tidings and cheer! Karen Turner Ward, the director of “Mistletoe Jam,” is a professor and the Chair of the Department of Fine and Performing Arts at Hampton University. She holds a Bachelor of Arts Degree in Drama and African American Studies from the University of Virginia, a Master in Fine Arts Degree in Acting from Virginia Commonwealth University, and a doctorate from Regent University. Dr. Ward’s professional activity includes producing, directing and acting. She has produced over ninety productions during her tenure at Hampton University. In addition to producing the following shows, she also directed them as well. Some of the shows she has directed include “What Use Are Flowers?” “The Colored Museum,” “Treemonisha” (an opera), “Desire Under the Elms,” “A Raisin in the Sun,” “The River Niger,” “The Amen Corner,” “Home,” “The Quiet in the Land,” “Ain’t Misbehavin’,” “Dream Girls,” “The Children’s Journey,” “Little Shop of Horrors,” “Grease,” “The Wiz,” “A Love To Call My Own,” “Through The Crack,” “Crowns,” and “Black Nativity.” Since the major emphasis in Dr. Ward’s professional training was placed on the area of acting, the majority of her experience prior to entering full-time teaching has been placed in this area. Dr. Ward’s representative roles include Aretha in “Legends,” Jewell in “The Best Little Whorehouse in Texas,” Lena in “A Raisin in the Sun,” Reena in “I’m Black When I’m Singing,” I’m Blue When I Ain’t,” a featured role in “Spoon River Anthology,” Widow of Florence in “All’s Well that Ends Well,” featured vocalist in “Side by Side,” Woman in “The Blue Hour … City Sketches,” Sister Boxer in “The Amen Corner,” Lady in Red in “For Colored Girls,” and a featured Vocalist in “Anything Goes.” Dr. Ward played the role of Billie Holiday in the Heritage Repertory Company’s “Lady Day at Emerson’s Bar and Grill,” which was presented at the University of Virginia and Theatre Virginia. She reprised that role in November 2016 at the Hampton Museum on Hampton University’s campus. Dr. Ward also co-starred with R & B singer Cuba Gooding, Sr. in the musical “Stop Cheating on God’s Time” for two years. Ms. Corinne Langford, costume designer for “Mistletoe Jam,” is from Flint, Michigan. She is the assistant professor of costume design for the Hampton Players and is excited to be intering into her second year with them. She received her BS in theatre design and technology from The University of Michigan Flint and her MFA from the University of Memphis. Mrs. Iris Goode-Middleton is the choreographer for “Mistletoe Jam.” Mrs. Goode-Middleton has been a performing arts instructor for over fifteen years. She attended and holds degrees from the City University of New York’s York College and Queens College where she dual majored in theatre arts and dance. She recently received the Master of Art degree in Theatre at Regent University. She has extensive performing arts training from many schools including: Dance Theatre of Harlem, Broadway Dance Center, Jamaica Center for Arts and Learning (JCAL), Theatre and Dance Alliance (TADA! ), and 92 Street Y’s Dance Educators Laboratory to name a few. She has worked as a teaching artist in New York City for many organizations including: Black Spectrum Theatre, Jamaica Center for Arts and Learning, New York City Police Athletic League, New York Urban League, Jackie Robinson Center for Physical Education, The Afterschool Corporation and The Partnership for Afterschool Education. She has worked as a choreographer on many productions. She has choreographed dance pieces for the dance department and the theatre department’s productions of the musicals “Sweeny Todd” and “The Wiz” for Carver School of the Arts. She did “Putnam County Spelling Bee” for Tri-Cities High School and University of West Georgia as well as “Rent” and “Bat Boy” for the University. She choreographed “For Colored Girls…” for the University of Georgia. She did dance sequences for two episodes of the first season of Lifetime television’s series “Drop Dead Diva.” She also did the choreography for Andre Benjamin of Outcast’s musical production of “Class of 3000” at the Alliance Theatre. Mr. Tim Ellis is a ten year Hampton resident. He has been the drummer for productions such as “Crowns,” “Little Shop of Horror,” “Through The Crack,” “Black Nativity” and more. This year, he has taken on a larger role as the Musical Director for “Mistletoe Jam.” When not working with The Hampton Players, he can be seen playing with his band On The Verge or at his local church Freedom Life Church. Mr. Desmond Harrison is the vocal director for “Mistletoe Jam” and co-owner of The VocalArt Company, a subsidiary of PlaylistSelect, LLC. Harrison is also a member of Alex Holt and Free Worship and serves as Praise & Worship Leader at Rock Center Church and Calvary Community Church. Harrison has worked with many national and local artists such as Dr. Peggy Britt, Tasha Cobbs (Grammy & Stellar Award Winner), Sunday’s Best Jermaine Sellers, Keli Nicole Price (Grammy Award Winner), Sunday’s Best Jessica Reedy, Chris House and many others. The cast of “Mistletoe Jam: A Holiday Musical Extravaganza” features Arleena Allen, Aaliyah Arnold, Michael Payne, Malachi Townsley, Stephanie Smith, Sierra Davis, Anthony Faulkner, Lindsey Miles, Morgan Best, and Sol Rae Edmund. Also featured in “Mistletoe Jam” are special performances by Dreams in Motion, The Goode Dance Project, and D & T Dance Studio. The Hampton Players and Company is a professionally run performing ensemble. The performers are not limited to the University stage, but have appeared on stages throughout the United States.